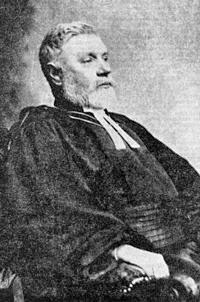 DR. GEORGE MATHESON was one of the most be loved clergymen in the Church of Scotland. His writings were numerous and of a high order; but the marvel of it all is that he was able to accomplish so much without his sight, for from the age of fifteen he was totally blind. His hymn beginning, "O Love that wilt not let me go," was sung out of his blindness and gives evidence of the courage with which he bore his great affliction. His own story of how he came to write the hymn is well worth quoting: "My hymn was composed in the manse of Innellan on the evening of June 6, 1882. I was at the time alone. It was the day of my sister s marriage, and the rest of the family were staying overnight in Glasgow. Something had happened to me, which was known only to myself; and which caused the most severe mental suffering. It was the quickest bit of work I ever did in my life. I had the impression rather of having it dictated to me by some inward voice than of working it out myself." William T. Stead quotes this letter from a correspondent : "At a time of great spiritual darkness, when God, Christ, and heaven seemed to have gone out of my life, . . . I heard this hymn sung in a little country chapel. The first two lines haunted me for weeks, and at last brought light and comfort to my dark soul."